Nissan is encouraging drivers to ‘hit the bottle’ – that’s water not alcohol – to raise awareness of the impact dehydration can have on road safety. While the dangers of driving after consuming alcohol are widely understood, there’s relatively little research on safe hydration levels for drivers. Furthermore, approximately two-thirds of drivers are unable to recognise the symptoms of dehydration – tiredness, dizziness, headache, a dry mouth and slower reaction times. The simple act of drinking more water can help address the issue. A 2013 study by two universities revealed that people who consumed a pint of water before carrying out mental tasks had reaction times that were 14% faster than those who did not have a drink. Nissan has showcased an innovative solution. With one in six people now sporting wearable technology, Nissan has taken inspiration from the health and well-being industry to create a possible future automotive use for advanced ‘smart’ materials. In conjunction with Dutch design brand Droog, a state-of-the-art sweat-sensing technology coating called Soak has been integrated into a Nissan Juke crossover. By applying it to the Juke’s steering wheel and front seats, the result is a simple yet effective alert system to warn drivers that they need to drink more water. The Soak coating works in a very simple way, changing colour when it’s in contact with perspiration – for example, on a person’s hands or clothes after exercise. When dehydrated the SOAK coating turns yellow; when rehydrated it turns blue. 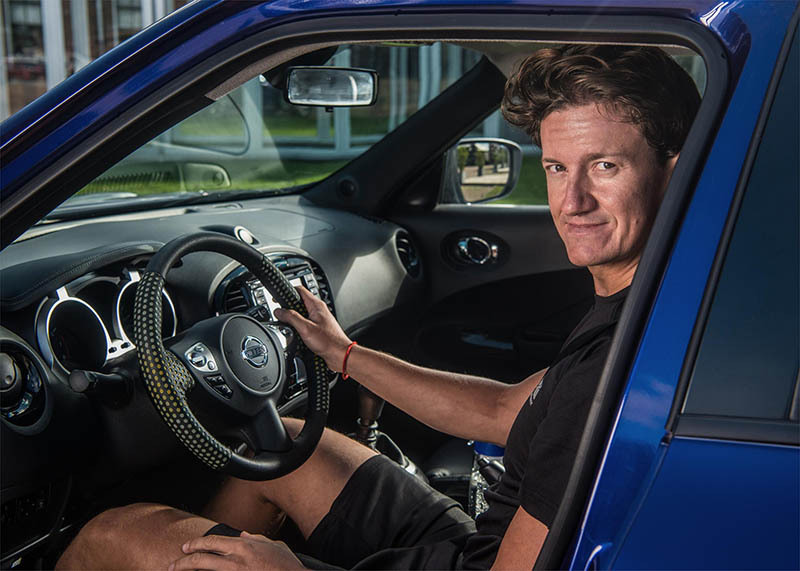 Racing driver Lucas Ordonez, inaugural winner of the Nissan GT Academy and today a NISMO (Nissan Motorsport) athlete, features in a video created to raise awareness of the impact of driving while dehydrated. The innovative Soak coating was originally the brainchild of Droog researcher and designer Paulien Routs. While Nissan currently has no plans to add sweat-sensing technology into the Juke, it illustrates the brand’s approach to innovation and pioneering safety technology. The Juke already features many advanced Nissan Intelligent Mobility technologies. These include Intelligent Around View Monitor with Moving Object Detection, Blind Spot Warning and Lane Departure Warning.